Christmas Day has been and gone; followed as ever by Boxing Day: time to work off the turkey. 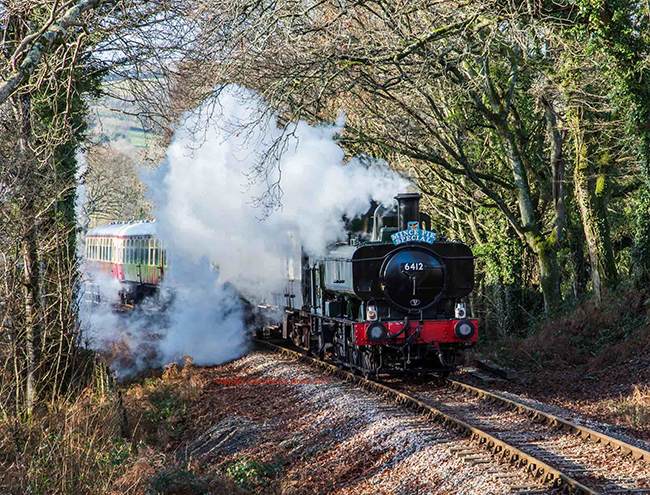 To help people do just that, the South Devon Railway ran a train service. 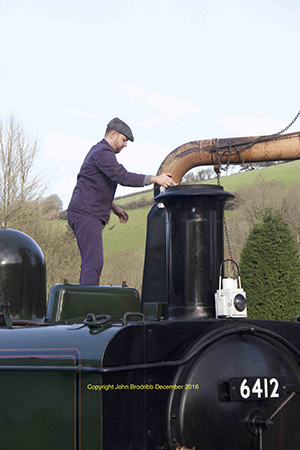 There were three return trips from Buckfastleigh, with the first two pausing at Staverton on their return journey to allow passengers to partake of the refreshment coach there, since the café and shop at Buckfastleigh were closed. It is very pleasing to report that the trains were quite busy, and although the 4.15pm from Totnes had relatively few passengers, it had taken several back to our station, including three very shaggy sheepdogs! 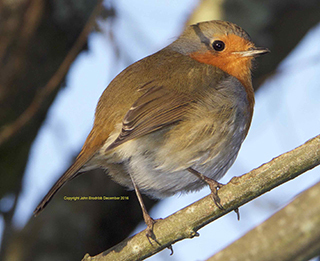 The weather was unseasonably spring-like, so a picture of a robin either emphasises that, or acts as a reminder of wintry Christmas scenes. As usual, a wholly volunteer-run operation, a great credit to everyone who turned out, and another plus for the SDR. Boxing Day trains? Whatever next – they will never catch on, at least on the national network. Fireman Rob Oaten carries out one of the most important jobs of the day, which is filling locomotive 6412 with water. Compared with the Santa trains the engine crew can have a lie–in: they aren’t on until 5.30am! 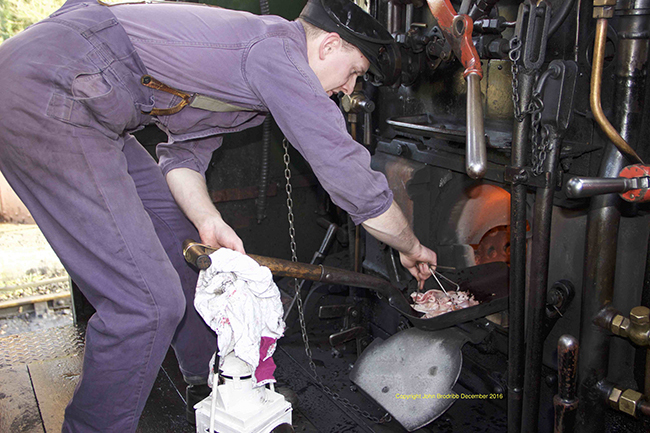 Driver Ben Greening carries out the most important task: cooking breakfast! Buckfastleigh station platform was fully staffed, including the museum; thank you to all the volunteers who turned out there. At Staverton the cafe coach was open and did a good trade, although it was declared a “turkey-free zone” No matter: the pasties and drinks were great, and the mince pies and clotted cream to die for. Again, a great credit to all the station’s volunteers. Sue and Steve Bates are in the photo, but several other staff were on duty. A down train approaches Staverton from Napper’s Crossing. At Totnes (Littlehempston, but not for much longer) the station was again fully staffed, and generated some traffic. More advertising in the town might be beneficial, though. Many thanks to the Totnes volunteers. No, I haven't forgotten the Regular Volunteer Guard: today's incumbent was Colin Rogers, whose photo featured last week. 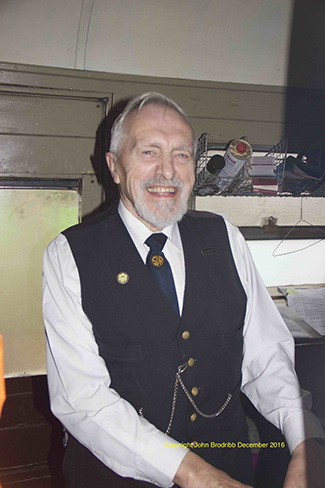 New Year’s Eve was a special day for long-serving SDR volunteer guard David Youngs, who hung up his flags for the last time when the train reached Buckfastleigh at 3.45pm. David is retiring from being a guard, but not from working on the trains. 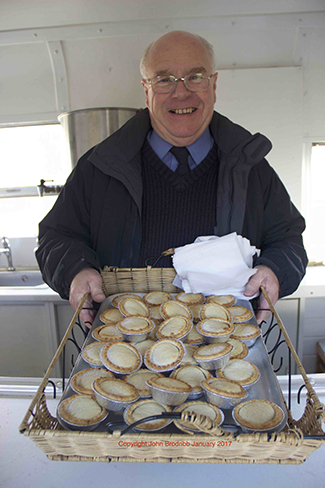 He will be back in 2017 as a buffet car steward. Very many thanks for all your hard work so far, David, and very best wishes for the future. 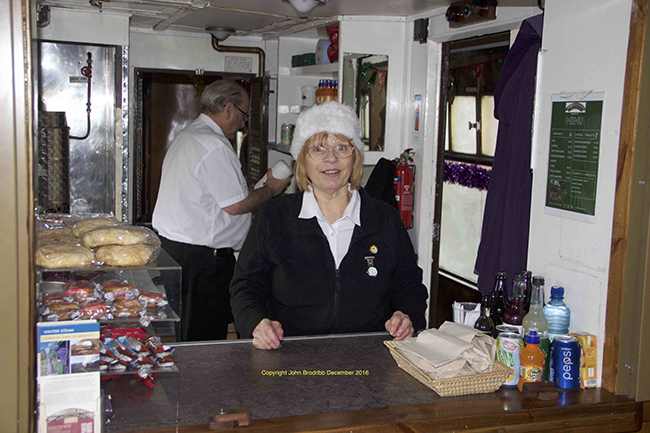 The season finally finished on Monday 02 January 2017, the final outing for the Mince Pie Specials. There is no doubt that they have been a great success, and passenger loadings seem to have been very good throughout. There was a nasty rumour that the supply of mince pies had run out, but Denis Johnson had ordered more, so there were plenty to go round. 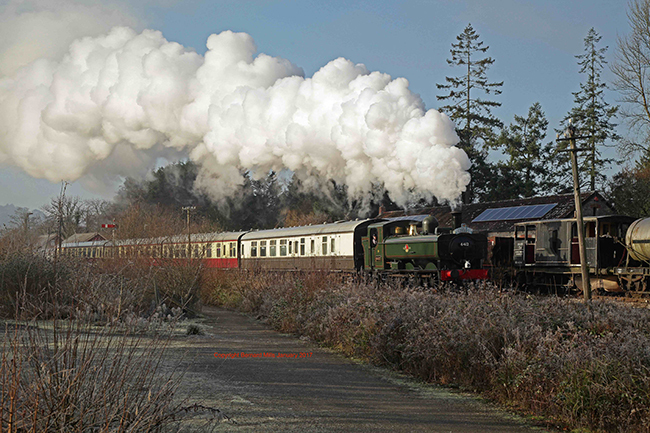 The green timetable operated throughout, except Boxing Day, with three return trips from Buckfastleigh. 6412 hauled four coaches, consisting of the kitchen car, buffet car 1917, and two blood'n'custard liveried Mark 1s. The steam heating worked well, although there were a few leaks, except in 1917 where it has been disconnected. The weather for the week was generally fine, mostly sunny, although Sunday was very wet. 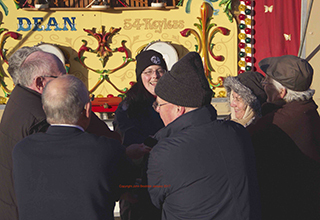 Being the last day of the season, the team gathered in front of Mike Stabb’s fairground organ – which has entertained passengers for the entire festive season - and sang Auld Lang Syne. Mike’s version speeds up half way through, which is quite entertaining! 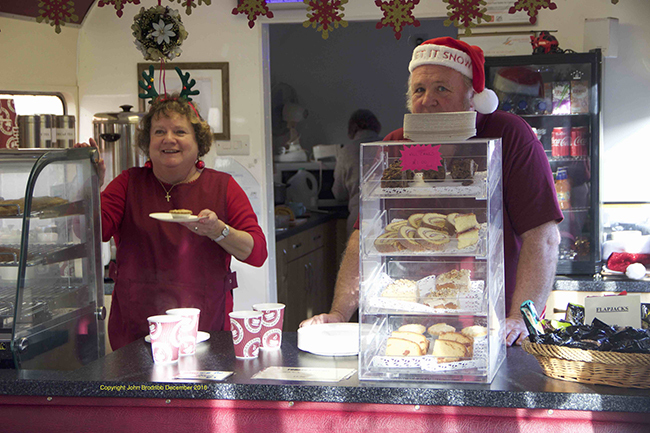 Another task today was taking down and packing away the Christmas decorations, done by Buckfastleigh Station Group. The grotto coach, W276, was shunted into the platform by Chris Williams and Alan Johnson, between service trains, to assist loading.